If you do make the trip to the Dry Tortugas via ferry, you’ll more than likely make landfall at Garden Key, the largest of the tiny islands that make up the Dry Tortugas. Most of the islands that make up the Tortugas are little more than atolls or islets, barely above sea level and covered by mangroves or small patches of grass. But Garden Key is different. It’s the second largest island (to Loggerhead Key) at 250x1200 meters (or about 2.5 football feels wide by 12 football fields long) and is home to Fort Jefferson and the no-longer-working Garden Key Lighthouse. Fort Jefferson is a huge unfinished fortress. Wikipedia.com says it is the second largest masonry structure in all of North and South America and built of 16 million bricks. Fort Jefferson is the mainstay and headquarters of Dry Tortugas National Park. The fort was built between 1846 and 1875 (although it’s never been completely finished) and was known in the 1800s as the “Gibraltar of the Gulf” because like a large fortress or even medieval fort! Constructed to serve as a fort to guard shipping lanes between Cuba, Jamaica, New Orleans and the East Coast of the U.S., it also served as a prison for Union deserters. While it may sound idyllic to be housed on the island, the prisoners actually suffered considerably thorugh heat, mousquitoes and yellow fever (remember, air conditioning and a reliable vaccine for yellow fever weren’t in great use until the mid-1900s). Tours are available for Fort Jefferson. A brick lighthouse was constructed even earlier (1825) on Garden Key to warn mariners about the dangerous shoals near the Dry Tortugas, as well as some of the lower islets themselves, which can disappear during high tide. The lighthouse, unfortunately, is not open to the public and the light no longer works. • Tour Fort Jefferson, either on your own or with a guide. 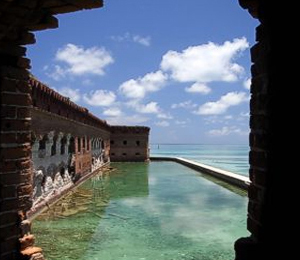 • Explore all of the islets that make up the Dry Tortugas. • Birdwatch (Dry Tortugas National Park is considered to be a world-class birding destination). • Kayak to nearby Loggerhead Key (you’ll need to bring your own canoe/kayak; rentals aren’t available on the island).